The BOOT - The Business of Online Travel: Is Google doing keyword memory and delayed paid search responses (or just broken)? What do Cairo and Machu Picchu have in common? Is Google doing keyword memory and delayed paid search responses (or just broken)? What do Cairo and Machu Picchu have in common? 'I was doing some random keyword searching on Google this afternoon. Looking up a series of destinations with the search lead in of "hotels in". I noticed a pattern emerging that I had not seen before. Sponsored search results for one destination stayed in the search results for a second destination. I will be specific. First I searched"hotels in Dubai, then "hotels in Cairo". Then I searched "hotels in Machu Picchu". Then I searched just "hotels". 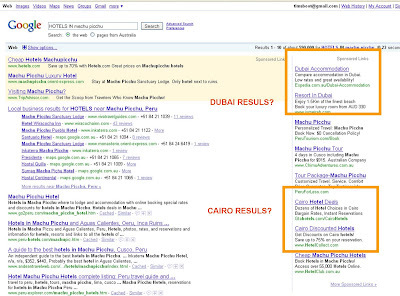 In the results for Machu Picchu there appeared sponsored links for Cairo and Dubai (see screen shots below). 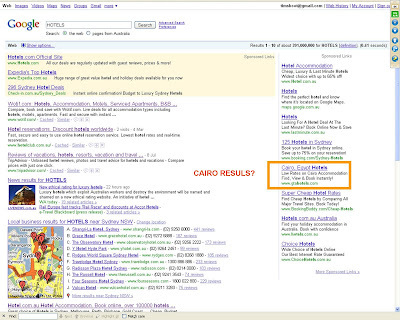 For the supposedly generic results of "hotels" there appeared Sydney results and Cairo results. Sydney results makes sense as that is where I am but Cairo does not. I am not sure what this means. One possibility is that Google is convinced that I continue to be interested in Cairo despite having entered other search terms. That (through me being logged in) it has run some algorithm on my past searches and Cairo comes up again and again. The other possibility is that the "broad match" bidding advertisers are doing is now getting more and more broad in terms of keyword matching and maybe even session time. Or - Google is busted. 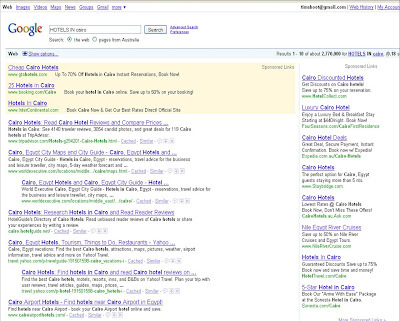 If the former options then the matching that Google is doing is not right as I do not have a history of searching for Cairo hotels. But is shows that Google is experimenting with behavioural targeting techniques. If the latter option (Google is busted) then a lot of advertisers are going to be very unhappy about the click costs that result. UPDATE - GOOGLE have confirmed that is part of broad matching. I think it's people using broadmatch keywords incorrectly - if you broadmatched for "hotels" and had a high enough bid and quality score you could come up for all those terms. You'd have to be pretty dumb to use the same text ad, but the world is full of morons. Searched: Hotels in Vancouver. All ads were for what you would expect. Searched: Hotels in Orlando. All ads were for Orlando hotels. Searched: Hotels. All ads were generic hotel ads or Montreal and Quebec hotel ads (I'm in Montreal so this makes sense). Disappointed I wasn't able to replicate your results, I then searched: Hotels in Cairo. And I was served a few Vancouver hotel ads!! So, in effect, I was able to replicate this phenomenon. This can be replicated any number of times.